Before taking over management of the Metroplitan at 59 Main Street in San Andreas, I wanted to learn a little more about the facility. It wasn’t easy. Every internet search brought me to some art museum in New York! I have learned that it was originally constructed as a hotel in 1859. The Met was destroyed in a fire in 1926, where evidently the lot sat vacant for the next 25 years or so. Then in the 1950s a movie theater was built. 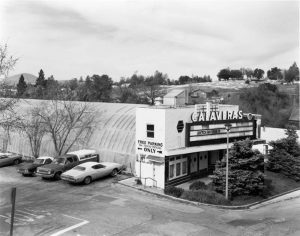 The movie theatre was in business until the 1970’s. Fianlly in the 80s, Don Cuneo renovated the facility to serve as a dining hall and event venue. Thanks, Don! The Met floors are black and white checkered from one end to the other, and the walls boast beautiful art deco paintings around the light fixtures. The red bar makes you feel like you’re stepping back in time, and the modern commercial kitchen is a pleasant surprise in the otherwise retro building. Rumor has it that Mark Twain found his inspiration for The Jumping Frog right in the Metropolitan’s bar-room. We hope you’ll drop by and visit the Met. Who knows, perhaps you, too will be inspired! Sharon, these are wonderful memories that shed a lot of light on this amazing facility. We adore the art deco style, and that bar is still gorgeous! Coincidentally, our first Murder Mystery event is also a roaring 20’s theme. It’s just so perfect for the Met! We do hope you and your husband will come visit us when we open. Our Grand Re-Opening is January 5, from 2-7 pm. Please introduce yourselves if you can make it. We certainly appreciate you sharing your memories, and for your part in making the Met what it is today!